To the apparent surprise of everyone, the Walt Disney Company has announced a deal to purchase Lucasfilm Ltd. According to the official press release, Disney has agreed to fork over $4.05 billion in cash and stock for George Lucas’ studio in a deal that brings together two of the world’s most important intellectual property libraries. As you might expect, Disney is itching to take advantage of its new toys. “This transaction combines a world-class portfolio of content including Star Wars, one of the greatest family entertainment franchises of all time, with Disney’s unique and unparalleled creativity across multiple platforms, businesses, and markets to generate sustained growth and drive significant long-term value,” said Disney CEO Robert Iger in this afternoon’s announcement. Under the terms of this agreement Disney will acquire control over all Lucasfilm iterations. This includes both its traditional film-making studio facilities, as well as the various technologies Lucasfilm has created over the years to further its various media properties. Thus, the gigantic Disney family now includes Lucasfilm itself, special effects house Industrial Light & Magic, Skywalker Sound and LucasArts, the company’s video game creation division. This acquisition alone would be huge news, but as if to pre-empt fan speculation on the future of Star Wars the same announcement also mentions that a new Star Wars movie is scheduled to appear in 2015. Though the vast majority of recent Star Wars media has been focused on the property’s various animated iterations and LEGO crossovers, this new film will be the first official cinematic continuation of George Lucas’ original Star Wars trilogy. Though very few details are offered on this film, it has officially been dubbed Star Wars: Episode VII, and barring any major catastrophes it should hit theaters at some point in 2015 (if we had to guess, we’d assume an early summer release in keeping with the tradition established by its predecessors). Perhaps even more intriguing however, is the announcement’s claim that Episode VII’s release will herald a new era in which new Star Wars movies hit theaters “every two to three years.” It specifically mentions Episodes VIII and IX by name, though offers no solid details on either film. While the effects of the move won’t be fully known for at least a few months, we can think of a number of a things this new union might change. For instance, currently Dark Horse Comics publishes all Star Wars comic books, but with Disney owning Marvel Comics we can’t see that agreement lasting for long. Likewise, both Disney and Lucasfilm have sizable divisions dedicated to creating video games based on their various media properties. Normally these companies have had to seek outside publishing agreements, but now that they’ve joined forces and massively expanded the number of games either company is capable of releasing in any given year, it makes a lot of sense for Disney to invest in its own games publishing wing. Finally, this agreement almost certainly heralds future crossovers between Disney and Lucasfilm characters. We don’t know any specifics, but it’s only a matter of time before we see toys depicting Mickey Mouse dressed as Darth Vader. Whether that sounds awesome or stomach-churningly disgusting is entirely up to your rapidly waning sense of childhood whimsy. Update: Scratch that last prediction. 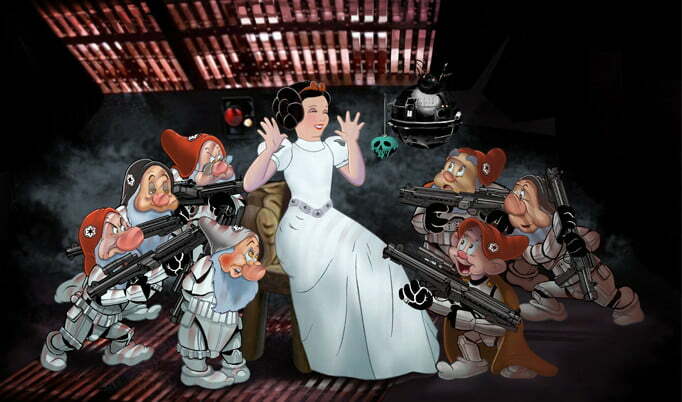 Apparently Disney characters dressed as Star Wars characters is already a thing. Our partnership with LucasFilm has produced over 20 yrs worth of stories. We have Star Wars for the near future, and hope for years to come.